A Brooklyn lawmaker has been named the tallest politician on earth. Roseanne Colletti reports. A 6-foot-10 New York City councilman from Brooklyn has been named tallest politician in the world. 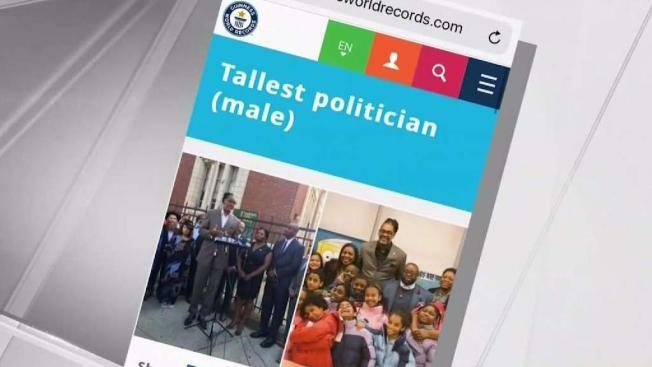 Robert Cornegy Jr. was honored for that distinction at a City Hall ceremony on Wednesday after being officially certified by Guinness World Records as world's tallest male politician on Jan. 14. Cornegy says he went for the title two years ago after a constituent jokingly told him "you have to be the tallest politician ever." Cornegy says being tall has its challenges, especially shopping for shoes and clothes. The previous record holder was a British member of Parliament named Sir Louis Gluckstein, who measured 6-foot-7-1/2 inches. He died in 1979 and was succeeded by another British politician who stood at 6-foot-6 inches.